Chase Elliott won the pole for Sunday's Food City 500 at Bristol Motor Speedway with a track record of 131.713 mph. For Elliott, this is the fifth pole of his NASCAR Monster Energy Cup Series career and first of the 2019 season. All four of driver No. 9's previous poles have came on superspeedways. "I've been wanting a pole outside Daytona and Talladega for quite some time," Elliott told FS1. "I feel like i haven't done my part. It was nice to get my guys one today. I had a fast NAPA Chevy." "We have some work to do. I think it's doable. Our car has pace. If we get it driving good, we can hopefully give ourselves a chance." Rounding out the top five were Hendrick Motorsports teammate William Byron in second (131.371 mph), Ryan Blaney in third (131.371 mph), Erik Jones in fourth (131.182 mph) and Denny Hamlin in fifth (131.057 mph). For William Byron, it marks the second straight race that the No. 24 car will start on the front row. Byron finished second in last weeks qualifying at Texas Motor Speedway coming up short to teammate Jimmie Johnson. Ryan Blaney, who initially topped the practice charts and broke the track record in the second round of qualifying, felt that his No .12 Ford was strong enough to win the pole, but errors by Blaney in turns 3 and 4 would cost driver No. 12. Last year's Food City 500 winner Kyle Busch will start 17th after coming up short of advancing to the final round of qualifying. Live coverage for Sunday's Food City 500 at Bristol Motor Speedway begins at 2:00 p.m. Eastern on Fox Sports 1. Waltrip, along with Mike Joy and former series crew chief Larry McReynolds, made up the original booth talent for FOX Sports when the network began NASCAR coverage in 2001. The move to television came after a driving career that saw Waltrip win series championships in 1981-82 and ’85 as well as 84 races. In 2016, three-time series champion Jeff Gordon joined Waltrip and Joy in the booth. As a racer in the early 1970s, Waltrip rocked the established stars of the day almost from the moment he arrived on the scene. By the end of the decade, he was winning multiple races and contending for championships. He was both loved and loathed as a competitor by fans and fellow drivers alike. His career as a broadcaster was equally notable as he quickly helped merge two very different eras of the sport, identifying seamlessly with the older established followers while teaching a younger audience the ins and outs of NASCAR. Mike Helton, vice chairman of NASCAR, noted that Waltrip has made “a remarkable impact on a lot of people personally but on our industry in general. Waltrip will remain in the booth for the remainder of the FOX portion of the 2019 racing season, which concludes June 23 at Sonoma (Calif.) Raceway. Saturday’s Alsco 300 NASCAR Xfinity Series race brings additional incentive for four drivers – the series’ seventh race is the first for this year’s Dash 4 Cash bonus program. Tyler Reddick (Richard Childress Racing No. 2 Chevrolet), Christopher Bell (Joe Gibbs Racing No. 20 Toyota), Chase Briscoe (Stewart-Haas Racing No. 98 Ford) and Michael Annett (JR Motorsports No. 1 Chevrolet) qualified for the opening round of the program based on their respective finishes a week earlier at Texas Motor Speedway. The highest finishing Dash 4 Cash-eligible driver in any of the four races – consecutive stops at Bristol, Richmond (Va.) Raceway, Talladega (Ala.) Superspeedway and Dover (Del.) International Speedway – earns a $100,000 bonus. The drivers agree on one thing – competing in a Dash 4 Cash event is very similar to NASCAR’s season-ending playoffs. The goal is to win the race but finishing ahead of the other qualifiers will be enough to collect the six-figure bonus. Reddick says his approach is the same as it would be for any race, but that “you kind of look at it like a cutoff (elimination) race. Natalie Decker, 21, will make her NASCAR K&N Pro Series East debut Saturday at Bristol Motor Speedway, competing in the Zombie Auto 150 for DGR-Crosley. A native of Eagle River, Wisconsin, Decker recently returned from Spain where she was one of 28 finalists competing for 18 spots in the new all-female W Series. While she failed to make the final cut, Decker said the experience was unforgettable. “It was amazing and so wonderful,” Decker said. “I’m so happy I did it. I have a lot to learn in road racing; I had never done that before. Decker has made three starts for the DGR-Crosley team this year in the NASCAR Gander Outdoors Truck Series. Her best finish was 13th at Las Vegas Motor Speedway. Bristol’s fast, high-banked, 0.533-mile layout left a quick impression. “When I first pulled in, I was getting dizzy just trying to look at everything,” she said. “I couldn’t imagine what it would be like when I got out on the track. Legendary racers Darrell Waltrip and Bobby Allison will serve as pre-race dignitaries for Sunday’s Food City 500. Allison will give the command “Gentlemen, start your engines,” while Waltrip will wave the green flag from the flag stand to officially start the race. The two NASCAR Hall of Fame drivers combined for four Cup Series championships and 168 victories. … John Hunter Nemechek (GMS Racing) paced the first of two Xfinity Series practices at BMS while Cole Custer (Stewart-Haas Racing) led the final session. … Harrison Burton, son of former NASCAR Cup driver Jeff Burton, is making his Xfinity Series debut at Bristol. The youngster was seventh fastest in the opening round and 13th in the latter session. … BMS officials announced a multi-year extension with race sponsor Food City on Wednesday. The regional grocery chain has held the naming rights to the spring MENCS event since 1992. It is the second longest race entitlement in the series. Coca-Cola has been the primary sponsor for the annual Coca-Cola 600 at Charlotte Motor Speedway since 1985. Already Denny Hamlin has won twice in seven Monster Energy NASCAR Cup Series races this season, demonstrating such high-level consistency that he is second in the standings heading into Sunday’s Food City 500 at Bristol Motor Speedway (2 p.m. ET on FS1, PRN and SiriusXM NASCAR Radio). And yet, despite a stellar a start to the season, Hamlin prefers not to rejoice over what his Joe Gibbs Racing No. 11 Toyota team has thus far accomplished. Instead, Hamlin prefers to look ahead, adamant that he and his team can – and will – be even better as the season progresses. Hamlin’s belief is supported by the fact while he has two wins -- the season-opening Daytona 500 and last week’s race at Texas Motor Speedway – he and his No. 11 team have actually been quite mistake-prone. The team has been penalized four times in the past three races for rules infractions on pit road – two for Hamlin speeding, and two for the pit crew having an uncontrolled tire. Last week, Hamlin had to twice rally back from penalties to win at Texas. Nonetheless, Hamlin’s two wins are tied for most in the series and he’s finished in the top 10 in every race but one. He trails JGR teammate Kyle Busch, who’s also won twice this season, by a mere eight points in the standings. It isn’t just the penalties Hamlin looks at as why he and the No. 11 team will be better in the future. Hamlin is in his first season working with crew chief Chris Gabehart, a first-year crew chief in the Monster Energy NASCAR Cup Series. Obviously, based off the results, Hamlin and Gabehart have clicked well enough that Hamlin is off to the best start of his 14-year career. But that all important chemistry between driver and crew chief, so often the difference from a team being very good and being excellent, is still developing, says Hamlin. He credits Gabehart for helping him evolve as a driver by bringing a different approach than what he’s accustomed to, coinciding with NASCAR implementing a new aerodynamic rules package this season that has required further adjustments. Ultimately, Hamlin wants to replicate the kind of relationship that Busch has with his crew chief, Adam Stevens. That will take time, though it is not lost on Hamlin that Busch and Stevens won the 2015 Cup championship in their first season together. “I just feel confident in that and knowing that certainly with a little bit more execution and more learning with me and Chris we’ve continued to get better and better every race track we’ve gone to,” Hamlin said. “We’re really learning each other more and more. 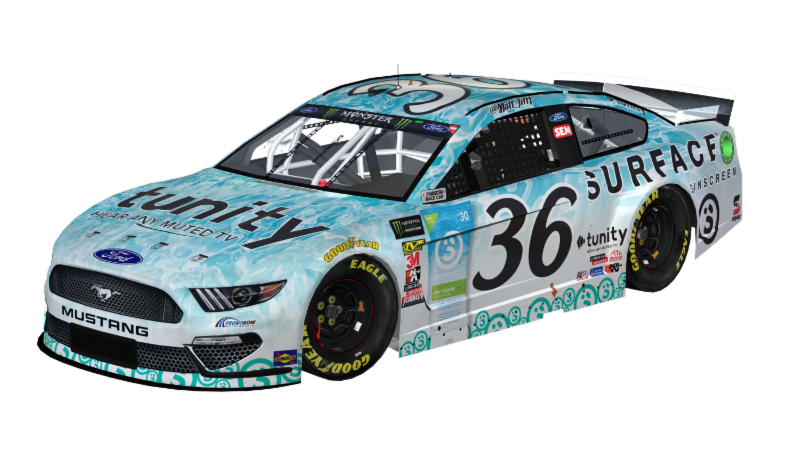 Joey Gase, MBM Motorsports, and Eternal Fan will honor Sam Bass in his home state by having his work spread all over the #66 Eternal Fan car at Richmond Raceway on Saturday, April 13th. Eternal Fan was created to provide a better way for fans to celebrate the passion that they have for sports and the places where they experienced positive shared memories. Eternal Fan’s customized Fan Memories programs are transforming traditions by creating legacies for people to celebrate their sporting lives for generations to come. Fan Memories Programs are currently available at Richmond Raceway and Watkins Glen International, as well as an ever increasing discussion on other venues. Tune in to Fox Sports 1 on Saturday, April 13th at 7:30PM ET to see the Eternal Fam/Sam Bass Tribute car during the Toyota Owners 400 at Richmond Raceway. It may not have been the outcome that Hendrick Motorsports has historically come to expect, but considering its recent performance the four-car team has reason to be encouraged by its collective performance last weekend at Texas Motor Speedway. The result saw Jimmie Johnson place fifth, William Byron sixth and Chase Elliott 13th. For Johnson and Byron, it represented their best finishes of the 2019 Monster Energy NASCAR Cup Series season, while Elliott would’ve likely finished higher had pit strategy not worked against him toward the end. The lone outlier among the Hendrick teammates was Alex Bowman in 18th-place, who started the race in a backup car after crashing in qualifying. “It’s good and it’s definitely a step in the right direction,” Byron said. But the indication that Hendrick Motorsports is making progress toward again being the dominant organization in the series customarily goes beyond just the finishing order at Texas. Whether it was practice, qualifying or the race, the Hendrick Motorsports Chevrolets flashed speed all weekend unlike they have all season. Johnson earned the Busch Pole for the O’Reilly Auto Parts 500 on Friday, then followed by posting the fastest 10-lap average speed in final practice on Saturday, which carried over to Sunday when the seven-time Monster Energy Series champion led a season-best 60 laps. Byron (second) and Elliott (third) also turned in impressive efforts in qualifying, and each backed it up by leading laps in the race. "For me, I was just trying to get a consistent weekend,” Johnson said. “It is one thing to have one-lap paced, we needed that and we did that on Friday. Then, Saturday went really well. So, in the back of my mind I was thinking we just needed to have a rock-solid day, and if we did that, then I could confirm to myself and to everyone else that we are moving in the right direction. Shining at the 1.5-mile Texas oval was particularly encouraging for the Hendrick camp. Intermediate-sized tracks have been a recent area of weakness for the organization where its Chevrolets have frequently been outpaced by Joe Gibbs Racing’s Toyotas and the Fords of Team Penske and Stewart-Haas Racing. Although there may not be another intermediate track on the Cup schedule until next month, Johnson believes the momentum coming out of Texas can propel himself and Hendrick Motorsports organization forward. He comes into Bristol Motor Speedway, site of Sunday’s Food City 500 (2 p.m. ET on FS1, PRN and SiriusXM NASCAR Radio), feeling he has a realistic chance of snapping a personnel winless streak that has now stretched to a career-worse 66 races. Johnson’s confidence heading into Bristol is further buoyed by his recent history at the high-banked, half-mile oval. Of his two-career victories there, one occurred in this race two years ago -- his second-to-last Monster Energy Series victory. And last season, even amid a lackluster campaign where he found success fleeting, Johnson still scored top-10 finishes in both Bristol races -- his third in the spring was a season-best. “I feel much better about things,” Johnson said. “Absolutely. This is what we've been looking for." The optimism expressed by Johnson is shared by his Hendrick teammates that one of them can celebrate in Victory Lane on Sunday. Bowman finished fifth in the Food City 500 last year, followed Chase Elliott joining Johnson in finishing in the top 10 in the August Bristol race. The expectation is that they will be able to replicate those performances on Sunday. Bristol Motor Speedway is the first of four Dash 4 Cash races for the NASCAR Xfinity Series this season where four eligible drivers will vie for a $100,000 bonus in the Alsco 300 on Saturday (1 p.m. ET on FS1, PRN, and SiriusXM NASCAR Radio). Christopher Bell of Joe Gibbs Racing, Stewart-Haas Racing’s Chase Briscoe and JR Motorsports teammates Michael Annett and Tyler Reddick are the eligible drivers competing to win the bonus by being the highest finisher among the four this weekend. Bell, Briscoe, Annett and Reddick earned their eligibility by being the highest finishing Xfinity drivers among those eligible in last week’s Xfinity Series race at Texas Motor Speedway. Reddick finished second in that race, Bell third, Briscoe fourth and Annett sixth. “You will more than likely have to win the race to win the bonus, so that is what our focus will be on,” Briscoe said. The driver who collects the $100,000 on Saturday automatically earns a chance to win another bonus in the next Dash 4 Cash race April 12 at Richmond Raceway. The other three spots will be occupied by the next three highest-finishing Xfinity Series championship-contending drivers in the Alsco 300. Additional Dash 4 Cash races are April 27 at Talladega Superspeedway and May 4 at Dover International Speedway. Ryan Preece, a full-time competitor in the Monster Energy Cup Series, is the defending Xfinity Series race-winner at Bristol. Preece is not entered in the Alsco 300. NASCAR driver Daniel Suárez will have one goal in mind when he makes his way to Talladega Superspeedway for the GEICO 500 on April 28. It’s simply to take his No. 41 Stewart-Haas Ford to Gatorade Victory Lane. But, on Thursday, he had another goal in view when he visited with the Atlanta United Major League Soccer (MLS) team. Suárez, who is still looking for his first career win in NASCAR’s premier series that could perhaps come at Talladega in a couple of weeks, made a pit stop at the Atlanta United Training Ground, home of the 2018 MLS Cup Champions. While there, he got a little taste of how the champs prep for their matches, then showed them a little about turning left. Suárez made the trek to the Atlanta area, less than two hours east of NASCAR’s biggest track. The Monterrey, Mexico native is an avid fan of soccer, and with his love of racing, he was right in his wheelhouse during his visit to the Peach State. As part of the day, Suárez joined the squad to try and “net” a win in an accuracy competition where the objective was to shoot straight through the center of a specially branded “Talladega Superspeedway” tire. Although he didn’t hit the middle of the target in what looked like “penalty kicks,” he was impressive and hit the rubber. After all, as a youngster, he was a “pretty good” soccer player but eventually chose to go the racing route. “Back when I was a kid in Mexico, I played a lot of soccer, it was just what we did,” said Suárez, who, in four starts at Talladega, has a best finish of 10th. “Who knows what could have happened if I had kept playing regularly back then, but it came to a point I had to choose either soccer or racing. After practicing some drills on the pitch, Suárez and some of the players hit the “track” for a different kind of racing - Adult Big Wheels style. It wasn’t child’s play in the heated two-lap dash to the finish, where Suárez’s drafting and side-by-side racing experience slingshot him to victory. Suárez is coming off his best performance so far this season, posting a third-place finish last week and 10th the week prior. He is inching ever so close to claiming his first career victory. If he doesn’t pull off the feat before he takes to the biggest track in NASCAR, he could become the 12th driver in Talladega’s 50-year history to capture their first career triumph at the 2.66-mile facility. As a rookie in NASCAR’s premier series at Talladega’s fall 2017 race, he looked to be in prime position for the victory as he and Chase Elliott battled for the lead in the final laps, but the two touched, igniting a multi-car pileup and resulting in a 15th-place finish. Last year, his No. 41 team’s Ford sat on the pole for the fall TSS event and dominated the race before running out of gas while in the lead on the final lap with Kurt Busch behind the wheel. Busch also finished second in last year’s GEICO 500. And, another positive is that Ford has been dominate at the mammoth facility recently, winning its seventh consecutive victory last fall. The GEICO 500 will be the anchor event for tripleheader weekend (April 26-28), kicking off on Friday, April 26, with the General Tire 200 for the ARCA Menards Series and continuing on Saturday, April 27, with the MoneyLion 300 NASCAR Xfinity Series event. Sunday’s GEICO 500 gets the green flag at 1 p.m. CDT. For tickets or more information, visit www.talladegasuperspeedway.com or call 855-518-RACE (7223). It will be one to go at the line for NASCAR Hall of Fame driver and FOX NASCAR analyst Darrell Waltrip when he hits the air from Sonoma Raceway in June.